We are excited to introduce the new iOptron SkyTracker™ camera mount for astrophotography. This portable mount makes it easy to take long exposures of the night sky without streaking or star trailing. The SkyTracker™ is simple to set up. Just attach the unit to a standard camera tripod. Then slide and lock your digital camera into the saddle. Align SkyTracker™ to Polaris, the North Star, using the included dark field illuminated polar scope. Then turn on the motor and it keeps your camera tracking at the same speed the earth rotates! The unique DC servo motor keeps your camera in motion to avoid star trails and allows you to take long exposures for beautiful images of the night sky. SkyTracker™ runs on 4AA batteries for portability at any location. 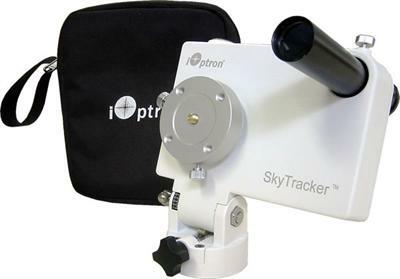 Click the button below to add the iOptron SkyTracker with Polar Scope to your wish list.